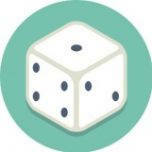 This bot can do random operations(generate numbers, passwords, GUID, choose random element, shuffle list of elements). Generate a random integer N such that MIN <= N <= MAX. Default values of MIN=0, MAX=100. You also can specify only MAX number. Shuffle the input sequence. Generate a random UUID.